Sky has acknowledged that some of its customers are experiencing slow internet speeds as a consequence of it signing up new subscribers. The firm said that it was working to boost capacity at telephone exchanges in the worst hit areas. The news coincided with the launch of Sky Go Extra - a service allowing users to download movies and TV shows so they can be watched offline. One expert said the product might add to the strain. Sky Go Extra still works at slow internet speeds - however, Sky's other streaming services rely on the user having a 2 megabit per second connection. Some subscribers have complained their download speeds have fallen below this level at peak times. 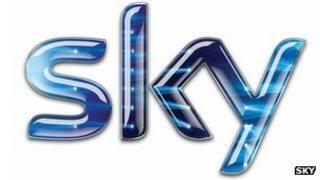 A Sky spokeswoman apologised for the problems. "Following a combination of an underlying increase in network traffic as well as a high rate of new customer additions, we are aware of capacity issues in a small number of exchanges," she said. "We are working on adding new capacity to those exchanges as quickly as we can. We apologise to all customers who have been impacted by this issue." She confirmed a report by The Register that users in Doncaster, North Wales and Bristol were among those affected, but declined to be more specific or name other locations. However, the firm has provided an online postcode checking facility for its subscribers to check if their local exchange has been flagged as having an issue. Sky also indicated that less than 5% of its broadband customer base used the affected exchanges. Andrew Ferguson, editor of the Thinkbroadband news site noted that Sky had recently run a major promotion highlighting the fact it did not place "fair use" caps on the amount of data its customers use. As a result, he said, the firm had probably attracted subscribers who downloaded significantly more than the average 23 gigabytes per month consumed by the average UK broadband user. "Sky had this problem last year in some of its exchanges, and it's definitely not the only service provider to have experienced this problem," he told the BBC. "It's very much related to the firms' promotional activities. Sky has also been pushing its fibre products recently - they offer higher speeds and people who sign up generally use more data afterwards." Fast broadband - who can compete with BT?